Scarab beetles possess mysterious powers that allow them to magically cross between the realms of the living and the dead to transport immortal souls. This duality is reflected in the Scarab deck and reveals how ancient Egyptian royals fair on either side of death. The Blue Scarab deck lifts the veil of death, exposing highly rendered details of the Egyptian rulers manifesting on the other side. The noble spirits illuminate the darkness, allowing the light to reflect off their gold adornments to reveal stunning hand-drawn details of these divine beings. Hints of iridescent blue highlighting their jewelry symbolize the heavens and bestow the power of rebirth upon ancient Egypt's most prestigious souls. All Blue Scarab cards are set against a stark black background, denoting the unknown and darkness of the afterlife. From building colossal pyramids to sculpting masterpiece sphinxes, ancient Egyptians were masters at executing the inconceivable, thanks to their extreme attention to detail. To honor their meticulous methods, the artwork of each Scarab deck pays homage to ancient Egypt's style and class. The incredible details of the Blue Scarab deck highlight the essence of life beyond the grave with shading and highlights that magnify the immortality of these royal beauties. The deck features highly stylized mirrored designs of a scarab beetle moving a beaming sun across an infinite horizon. Two interlacing elliptical-shaped borders enclose the design, each representing a spirit's path through either life or death. Passageways between the realms lie where the borders intersect; however, souls can only crossover if transported by the omniscient scarab. Bring ancient Egypt's royals to your next card game... after all, who's better off in your hand than the most majestic rulers in history? Bring the forces from beyond with the help of the Scarab decks to ensure that your game will be victorious. Open these beautifully crafted tuck boxes to unleash the power of the Scarab into your next hand! An image of the blue-winged Scarab carrying a sun sits in the lower right corner of this tuck box's front. With all of the power this scarab is packing, it couldn't be justified to tarnish this box with anything less than perfect. Much like the yin and the yang, one deck could not exist without the other. Together both Blue and Red Scarab decks complete each other, signifying the cycle of life and infusing immortality in your house of cards. 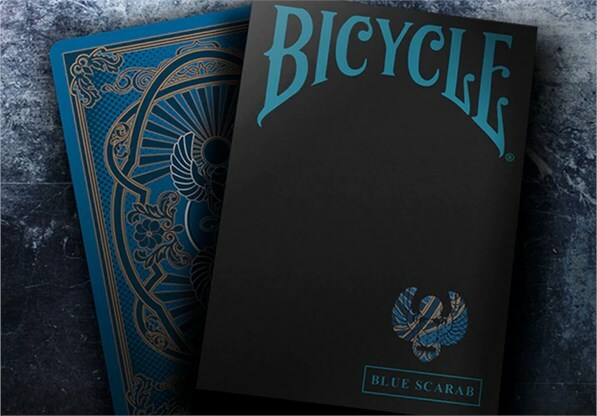 Complete your collection by purchasing the Red Scarab deck to go with your Blue Scarab deck. Ancient Egyptian royalty held the highest standards for manmade works of art, which is why these suits were designed to fit the high-class tastes of nobility. A delicate border of gold-stylized designs accents the suit's natural shape, while intricate gold designs with mirrored images decorate each suit's interior. The subtle gold accents deliver a tasteful presentation that fits with the expectations and principles of these ancient beings.